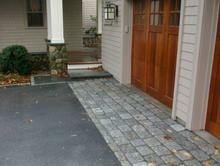 Bluestone is a favorite New England paving stone. Colors include gray, blue and lilac. This versatile stone mixes well with other stones and can be used in pattern shapes and natural broken form. Traditional brick walks have been used in New England for hundreds of years. They are still being chosen for their classic appeal for new and old homes. Our gallery includes examples of several different patterns. The most effective way to guide visitors through the landscape is by varying texture and appearance of paved surfaces. Walks identify desired traffic areas while protecting plantings. Changes in surface texture can also identify desired destinations such as patios, sitting areas, or play areas. One of the oldest paving stones, cobblestone finds many uses in historic landscapes as well as traditional homes. 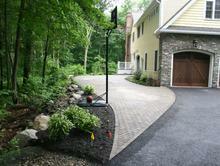 Click to see examples of driveway bands, ramps, and paths. 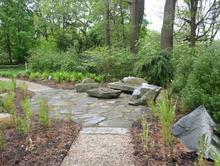 Stepping stones are a great solution to create beautiful informal pathways. 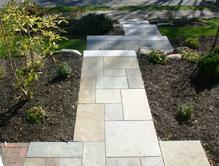 Steppers can be granite, bluestone, or fieldstone. Our examples go beyond the traditional stepping stone path. 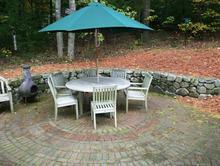 Concrete pavers are available in an almost limitless variety of colors and textures. They allow great flexibility in design while keeping tight design tolerances. 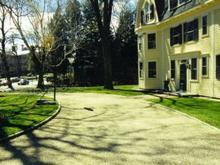 Asphalt is the most common material for driveways. Chipseal offers a rustic look appropriate to historic areas. Pea stone and/or pebbles are ideal for walks because they are available in many colors and sizes.